Devon Summersgill (right) believed her baby, Kate (left), would be born with Down syndrome based on a prenatal test that turned out to be wrong. MAPLEWOOD, N.J. — Little Kate Summersgill certainly didn’t look like a child with Down syndrome — no upward slanting eyes or telltale flat facial features. Devon and Mike Summersgill had believed baby Kate was all but certain to be born with the intellect-stunting disorder because of a blood test Devon’s doctor recommended during her 2014 pregnancy. Even after the birth, when their baby looked fine, their genetic counselor, Laura Limone, insisted that the result of the test was not a mistake, Devon Summersgill says. Only after the Summersgills agonized over Kate’s future and spent almost $2,000 more on another test were they satisfied that Limone was wrong — their baby was fine. And when they learned that Limone had a financial relationship with the company that makes the test, called MaterniT21 PLUS, they wondered whether money had influenced the counselor’s advice. “My first reaction was just utter confusion followed by anger,” said Devon Summersgill, 33, a special education teacher. 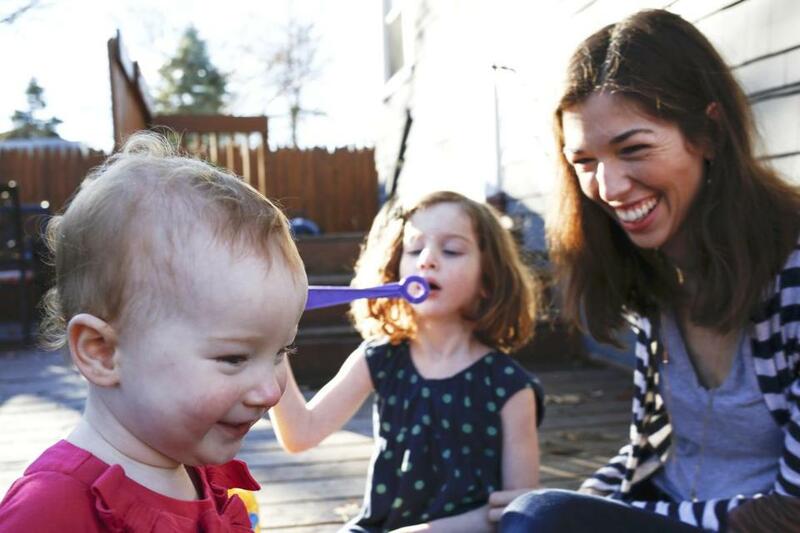 Parents are starting to question the independence of the fast-growing field of genetic counseling as more and more counselors are paid by the companies that make the tests. About 14 percent of the nation’s 4,000 genetic counselors worked directly for testing labs in 2014, up from 9 percent just two years earlier, according to their professional society. The balance tend to work for hospitals or doctors’ practices. “It’s a mass exodus to labs” where pay tends to be higher and the perks are better, said Cori Feist, a genetic counselor with Oregon Health & Science University. Eighteen states, Massachusetts among them, license genetic counselors, but none of them requires disclosure to patients if a counselor is paid by a lab. Limone, the counselor in the Summersgill case, does not work directly for a lab. She disclosed in a medical journal last year that she is a member of the “speaker’s bureau” for Sequenom Inc., maker of MaterniT21, and has been paid to speak about its test. Sequenom confirmed it has paid her. Limone said she does not order tests for any financial gain, and offers patients tests made by multiple companies. She said she did not order the Sequenom test for Summersgill, but otherwise declined to comment on the case. Jessica Daviso of Andover said that her genetic counselor should have told her that a test showing her fetus has a rare disease was probably wrong. “I have no difficulty making decisions based on sound science,’’ Limone said by e-mail. But the insurance industry and some state regulators are beginning to crack down on the ties between genetic counselors and the testing companies. As of this year, some health plans offered by insurer UnitedHealthcare no longer cover certain genetic tests ordered by counselors who work for labs. Cigna Corp. already has a similar policy. Concerns are also growing that counselors working in close proximity to patients in doctors’ offices may be overpromoting tests. Pennsylvania and Florida have prohibited lab personnel, including genetic counselors, from working at health care providers’ sites. George J. Annas, a bioethicist at Boston University’s School of Public Health, said counselors have an incentive to favor companies that pay them, and that may color what they tell patients, including what to say about a test’s limitations. Whenever a “highly competitive commercial business” gets involved in medical choices, “you’ve got problems,” he said. Officials at Laboratory Corp. of America Holdings, which sells a broad array of tests, say the 140 genetic counselors its employs always put the patient first. F. Samuel Eberts III, the company’s chief legal officer, said having counselors based in doctors’ practices — fewer than half of the company’s total — is convenient for patients. “There is no potential or real conflict of interest,’’ he said in an e-mail. The counselors aren’t salespeople and can offer tests from other companies, he wrote. There’s little question that genetic counselors are operating in a more free-wheeling environment than other health care professionals. The Food and Drug Administration doesn’t regulate the majority of the estimated 13,000 genetic tests offered by US labs, according to a federal database. Companies don’t have to prove to regulators that their tests are accurate to be able to sell them. Most medical companies must report how much they pay doctors for research, royalties, travel, and speaking fees, but the federal law doesn’t cover payments to genetic counselors. As a result, patients often have no easy way to know whether their counselor has a possible conflict of interest. e-mails between her and a Counsyl genetic counselor, Kristen Rauch. Rauch told Daviso that a study showed the “false positive” rate for Turner and similar syndromes was about 1 percent, the e-mails show, and recommended a second test that would confirm the condition. Daviso and her husband, Eugenio, then sought out experts at Tufts Medical Center, where a genetic counselor looked at the test and other factors, including her age and other personal data, and estimated there was only a 14 percent chance that her fetus had Turner’s — not the near certainty that Daviso said she was led to believe. That’s because the false positive rate is only one factor in measuring a test’s accuracy. In pregnancy, it represents the percentage of times that women carrying healthy fetuses are given false alarms. But a pregnant woman who receives a positive result needs to know something more: among the much smaller group of women who test positive, how often is the test right? Many prenatal genetic-test companies do not prominently advertise this rate, known as the positive predictive value, the New England Center for Investigative Reporting has found. After the Tufts input and ultrasounds that have not indicated a problem, Daviso declined to have the more definitive test, which carries a risk of miscarriage. She is due in April and says she and her husband believe there’s little chance the baby will have Turner. Rauch declined to comment, but the company’s chief science officer, Eric Evans, said Counsyl helps patients understand that the test Daviso had only reports the chance of a problem. If someone tests positive, he said, a diagnostic test is needed for confirmation. The company has reported numbers on the likelihood that a positive test result is correct for several genetic conditions, but not for Turner syndrome, Evans wrote. The genetic counseling field is exploding — with 29 percent job growth forecast over the next decade — in large measure because labs offer noninvasive prenatal tests, or NIPTs, which require only a simple blood sample. Other prenatal tests, such as amniocentesis, require fluid extraction from areas close to the fetus, bringing a risk of miscarriage. The tests usually retail between $700 and $3,000 and are expanding rapidly. One market research firm estimated the global market at $563 million in 2014 and predicted 18 percent annual growth through 2020. Several studies have found that noninvasive test results indicating a fetus is at high risk for some genetic problems can be wrong more than 50 percent of the time. Some women appear to have terminated pregnancies based on the screening test alone, according to scientists and an industry-funded study. Officials at Stanford University in California said in 2014 that there have been at least three cases of women aborting healthy fetuses relying on results of a genetic screening test. But commercial labs say genetic counselors understand the science behind the tests and that they play a vital role presenting accurate information to both doctors and patients. Physicians who can’t keep up with the fast-changing science “value the testing but don’t always feel equipped to fully use it,” said Rachel Klein, a genetic-counseling manager for New Jersey-based BioReference Laboratories, which offers a broad range of genetic tests, including prenatal diagnostics. The company employs 130 genetic counselors. Still, some commercial labs such as BioReference and Quest Diagnostics Inc., which place a limited number of counselors in doctors’ offices, say they are phasing out the practice. Devon Summersgill said it was her obstetrician, Dr. Neil Russo, who suggested she give a blood sample for Sequenom’s MaterniT21. After the positive test result, Summersgill said, Russo told her the screening test was 99 percent accurate and referred the couple to New Jersey Perinatal Associates, a high-risk pregnancy practice where Limone works. Limone said she is not paid by Sequenom for New Jersey Perinatal test orders. Summersgill said Limone told her the test was almost certainly accurate. Limone said the false positive rate for the test was tiny — 0.2 percent, according to medical records the Summersgills shared with NECIR. The Summersgills say Limone told them an amniocentesis would have to be done to confirm the finding. As a teacher, Summersgill had dealt with children with Down syndrome, and she and her husband had already decided abortion wasn’t an option because “we felt she could live a happy and fulfilling life.” They chose not to risk a confirmatory amniocentesis. After Kate’s 2014 birth, another genetic test the couple sought from a hospital seemed to rule out Down, and they began to breathe easier. Then came a follow-up call from the obstetrician, Russo, who ordered the original test. The doctor insisted that he had never heard of a MaterniT21 test being wrong, according to Summersgill, and suggested another call to Limone. Dr. Wayne LaMorte, who teaches medical-test interpretation in a course at Boston University, calculated that a positive Down screen from Sequenom was correct for someone of Summersgill’s age only about half the time. The Summersgills said Limone never told them the test could be wrong so often for someone of her age group and did not disclose her association with Sequenom when she counseled them on the test results. They say the experience has left them concerned that women may terminate pregnancies based on test results that are shakier than portrayed. “We squeezed a lifetime of worry into six months of pregnancy,’’ Mike Summersgill said. This report was produced in partnership with the McGraw Center for Business Journalism at the CUNY Graduate School of Journalism with support from the National Institute for Health Care Management Foundation. Beth Daley can be reached at bdaley@bu.edu. The New England Center for Investigative Reporting is a nonprofit newsroom based at Boston University and WGBH. NECIR interns Caitlin Bawn and Ellen Cranley contributed to this report.